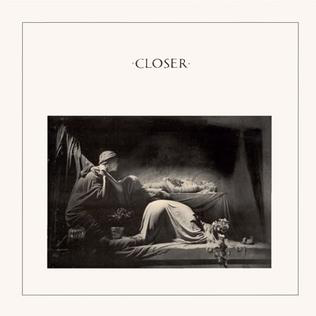 From the jagged, edgy opening of "Atrocity Exhibition", with its addictive drum rhythm and grinding guitar interjections, and the dour, self-explanatory and very atmospheric "Isolation", this is an even more challenging album than their debut from the previous year, "Unknown Pleasures". The group push the "post-punk" boundaries even further into the realms of paranoid introspection. They really were a perplexing, inventive group. Yes there were others with the a similar sound and dour image, but none did it quite so genuinely disturbingly as Joy Division. I have to say that "Atrocity Exhibition", turned up loud, sounds marvellous. Totally infectious. 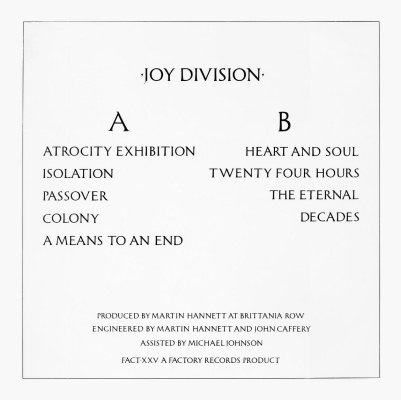 Tracks like "Passover" are classic examples of the Joy Division sound - pounding, doleful drums, big rumbling bass, mysterious keyboards and quirky vocals. It is one of the album's best cuts. "Colony" ploughs the same furrow. As also does the ghostly "A Means To An End". It is all pretty unnerving stuff. They sort of re-wrote what "rock" music, whatever you call it, was about. Out in the charts in 1980, there was effervescent, tuneful new wave material, lively, joyful ska, commercial reggae and poppy disco-ish stuff was still around. All of this was a world away from Joy Division. After singer Ian Curtis's untimely death, they regrouped as New Order and continued in the same vein until it was clear they couldn't keep putting out stuff like this and reinvented themselves as an upbeat, positive dance music group, mastering that particular genre. The seeds were sown here, though, just listen to that intoxicating bass line on the beguiling "Heart And Soul" and the metronomic drum sound too. This material influenced so many subsequent bands, both in the post punk genre and the dance music boom beyond. There is more sumptuous, industrial bass on "Twenty Four Hours". Despite being very adventurous in the UK in 1979-80, this is all very much created under the influence of the Krautrock German bands - Kraftwerk, Neu! and Can and, of course, David Bowie's late seventies work, although he never was as gloomy as this. A sombre, insistent track like "The Eternal" is rock noir, if there was such a thing. Deep and dark. The only thing coming close at the time was Talking Heads' "The Overload". "Decades" is very similar. This album, if anything, was even more dour than its predecessor. Beautifully dour, at times, however. Personally I quite like an occasional half hour or so of it. It sort of gets into your system. I wouldn't want to listen to little else, though. The 2007 remasters of both albums are excellent, too. The bass sound is really highlighted and there is a warmth and depth to the sound.